It’s not the same as a political party’s platform. Think of it as a metaphor for a structure that will boost you up and make you visible to potential readers, sources of publicity and bookstore buyers. Components in your platform include websites, blogs, business connections, social media, radio and TV appearances, quotes in media, online men­tions, speeches, articles, friends, neighbors, etc. Your first book is part of your platform and should help sell your later books. If you hope to convince a publisher to invest in your book, you'll need to prove you have a platform. 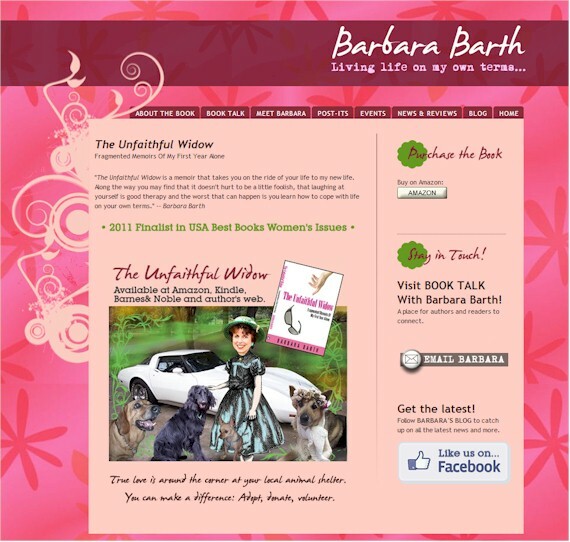 (above) Website home page for Barbara Barth, author of superb book, The Unfaithful Widow. It’s extremely important to have a website, or several websites, to provide information about you and your books. It’s neither difficult nor expensive to build and maintain a website, and most self-publishing companies can provide basic websites for their authors. If you don’t have a website, you are missing a major opportunity to impress and interact with potential readers. Readers expect authors to have websites. Don’t disappoint them. You can have a website to promote one book, a series of books, a cause you support, your publishing company, you as an author, you as a person, etc. The more, the merrier. The more sites you have, the more likely it is that people will find you, and the more opportunities you will have to sell books. Your site or sites should have information that will be useful and interesting to potential readers, as well as to members of the media. Fortune magazine once said that a website would take six months to develop and cost $500,000. 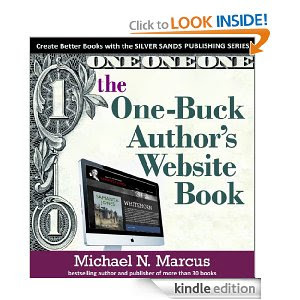 A well-known book marketing expert wrote that a writer’s website could cost as much as $6,000 to set up. Both costs are very wrong and could needlessly scare off writers who would benefit from having websites. Today you can develop a website for zero dollars and no cents in less than an hour, and pay less than $5 per month to a “hosting company” to make the site available to the world. Prices at 1&1 and GoDaddy can be as low as $3.99 per month. I use Wix (starting at $4.08 per month), Network Solutions (starting at $4.95 per month) and Yahoo (starting at $2.50 per month). Free hosting is available from several companies, but is generally not a good idea because you’ll get a long, clumsy, ugly, amateur-sounding URL (“Uniform Resource Locator” or web address) like http://billsbook. nrk44.freehost123.us instead of www.billsbook.com. Short URLs are better than long ones. While URLs can end in a variety of ways, including the ubiquitous dot-com, as well as dot-net, dot-USA, dot-CA, dot-TV and others, it’s generally best to use dot-com. If your website is DavidsBook.net, many people will go to DavidsBook.com. They may find nothing—or a competitor. Resist the temptation to use the dot-net version of a URL that’s already in use as a dot-com. As of the end of 2011, there were reported to be more than 225 million URLs in use! While it’s been said that all of the good URLs have been taken, your book name should be unique, so you have a pretty good chance of getting it as a URL. If you want a URL with your personal name in it, you may face some competition. Pay a few bucks so you will own similar URLs to capture bad spellers and to lock out potential competitors. Direct them to your site. You can register the alternate “phantom” URLs at NetworkSolutions and have traffic forwarded to the real website address. Many book websites include an “online press kit” that replaces the once-common cardboard portfolio. At a minimum, the kit (which is really a page or a section of a website) should include a news release (“press release”) about the book, plus photos of the cover and the author and a brief author’s biography. Obviously, your website should inform people what your book is about and try to convince them why it is vital that they buy it. The site is a good place to post reviews and comments from readers, reviewers and previewers, and to note awards the book has won. You can also show your table of contents and some excerpts to get people interested. 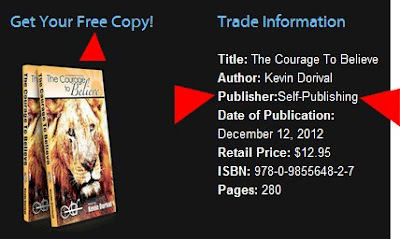 (above) There was nothing on Kevin Dorival's website that explains how to get a free copy of his book. The name of the publisher is probably not "Self-Publishing." Make sure your website is complete, accurate and has no dead links, inaccurate links or template artifacts (below). Update your site at least three times per year. Add content. Remove stale content (especially dates for events that have already passed). Change colors, type and layout. The site should seem fresh, not stale or neglected. Make sure your copyright notice has the current year. If It's October or later you can put in the next year so you won't have to remember to change it in January. Some authors hire website designers. I don't. You don’t need any special talent, experience or training to put a website together. Most hosting companies offer adequate and attractive templates which you can use as-is or modify if you want to. They are WYSIWYG (pronounced “wizzy wig” and standing for “What You See Is What You Get”) and allow you to get online in a few minutes—but you may spend the rest of your life updating and fine-tuning. If you have stronger creative impulses, you can design a website from scratch using such software as Microsoft FrontPage (discontinued, but still useful), PageBreeze, Adobe’s DreamWeaver, and Microsoft’s Expression Web and SharePoint Designer. There are books and businesses that specialize in SEO (search engine optimization), the process of getting a website into a top position in Google, Bing, Excite, Yahoo and lesser search engines. The SEO experts charge for their services, but I’ll gladly give you some free tips based on personal experience. People search for keywords (specific important terms, like “bicycle” or “Cambodia”) and it’s important that your book website include all relevant keywords, used as often as possible, without seeming obvious, artificial or awkward. Include important keywords as often as possible without seeming artificial.Don’t try to scam the search engines by using white type on a white background, black on black, etc..
Keep in mind that many potential readers don’t know that your book exists, but may simply be searching for information about buying or using a product. If you have a book about bicycles or amateur beer making, you want to attract people who are shopping for bikes or hops or need advice about fixing a flat or deciding on dry vs. liquid yeast. Keyword-based online ads, such as Google’s AdWords, are great for driving potential book buyers to your website or to sites that sell your book. Unlike a mass of shotgun pellets, they are like aiming one bullet at a single, near­­­by target. Because the ads should be seen only by people who are searching for specific subjects that your book deals with, they can provide a lot of website traffic for a few cents to a few dollars per mouse click. Google’s legendary algorithm that determines a website’s position has been subject to much speculation, and it’s protected as carefully as the formula for making Coca-Cola. One key ingredient in Google ranking is the number of inbound links to a website. Google assumes that the more sites that link to a particular site, the better that site is, and the higher it deserves to be in the Google list. Google interprets a link from Susan’s website to Charlie’s website as a vote by Susan in favor of Charlie. You should create inbound links in any legitimate way you can. If you post a comment in an online forum, put your website address in it. If you’re active in LinkedIn, Facebook and other social networks, promote your website there. Every email you send can list your site, and, of course, the web address belongs on your business cards and letterheads. If you have multiple websites, each one should promote the others. 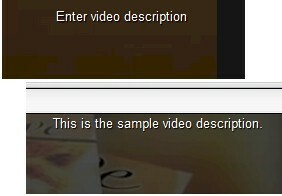 You can also ask the operators of other compatible but not competing websites to exchange links with you. Some people will find your website by searching for terms that are within the site, and others may search for the name of your company, a book or your personal name. If Google thinks your company is important, it will provide links to interior pages—not just the home page. My Silver Sands Books site gets treated just as well as book giant Simon & Schuster, which is part of CBS. Simon publishes about 2,000 book titles each year. So far, we did eight In our best year but Google makes us look important. To judge your progress, you can use websites such as WhoLinksToMe. These are the results for one of my websites: Google PageRank: 4. Google Links: 54. Yahoo Links: 2,940. Bing Related: 309. Older sites tend to rank higher than newer ones. Even if your book won’t be out for a year, get a preview online right away so you can gradually make your way upward in the lists. Track your traffic (hits). If few people visit your site, maybe you don’t have enough of the proper keywords or maybe you chose the wrong subject to write about. Use search engines to find what people are saying about you or your book. If you find an error, try to correct it. Sooner or later the bots (robot indexers) or web crawlers used by the search engines should find your website, but it can’t hurt to tell them you exist. You may get emails from services that promise to Submit Your Website to 300,000 Top Search Engines for only $299. There are not 300,000 top search engines, or even 30. You should care about only a few. When you launch your website, notify the major search engines. At least once a day, check to see that your website is really “on the air.” There are services that will check for you, such as WebsiteAvailability.